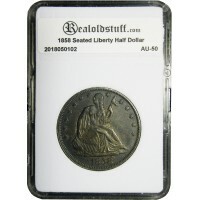 The Seated Liberty portrait designs appeared on most regular-issue silver United States coinage during the mid- and late nineteenth century, from 1836 through 1891. The denominations which featured the Goddess of Liberty in a Seated Liberty design included the half dime, the dime, the quarter, the half dollar, and until 1873 the silver dollar. Seated Liberty coinage was minted at the main United States Mint in Philadelphia, as well as the branch mints in New Orleans, San Francisco, and Carson City. The basic obverse design of the Seated Liberty coinage was designed by Mint engraver Christian Gobrecht, which consisted of the figure of Liberty clad in a flowing dress and seated upon a rock. In her left hand, she holds a Liberty pole surmounted by a Phyrgian cap. The date of the coin appeared on the bottom below Liberty. The basic reverse design of the Seated Liberty Half Dollar featured a central eagle about to take flight, with a striped shield upon its breast. The eagle clutched an olive branch of peace in its right talons and a group of arrows in its left talons. Above the eagle around the rim were the words "United States of America" and below the eagle around the rim lay the coin denomination. Beginning in 1866, the coins featured a ribbon with the motto "In God We Trust" above the eagle. This is an example of the 1858 strike in Almost Uncirculated Condition. Seated Liberty coins in conditions above Very Fine are difficult to locate due to the high relief of the obverse shield with "Liberty" and the eagles eye on the reverse being easily worn.